Welcome to the roller coaster! Full of exciting milestones, the toddler years are also prime time for frustrating parenting moments as your little one tests limits and deals with big emotions. If you’ve read our article about parenting styles, you’ve learned that over four decades of research points to authoritative parenting as a gold-standard. 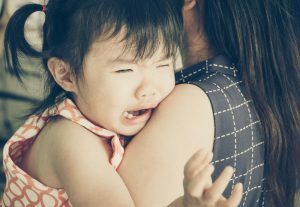 Here are a few authoritative strategies to help you teach your toddler skills to respect expectations and manage her feelings. Prevent — Toddlers are generally more tantrum-prone when they’re hungry, tired, or have access to off-limits stuff. Routines and babyproofing can help ensure that your little one is well-fed, rested, and not tempted to play with things she shouldn’t. Distract & Redirect — For example, if you know your toddler loses it when Grandma leaves after a visit, have something fun ready to shift her attention right after saying goodbye. Connect — This works well when your toddler’s tantrum is due to tiredness, frustration or sadness. Try holding her and empathizing: “You’re sad that your toy broke,” until she calms down. Ignore — When your toddler is writhing on the floor screaming because you won’t give her a cookie, ignoring her teaches her that tantrums are not an effective way to get your attention or what she wants. As soon as she stops, engage with her in a positive way so she learns the power of calming down. Stay Calm — Easier said than done! The thing is, none of your tantrum-busting strategies work if you’re angry. It’s perfectly okay for you to step away and take a deep breath (or several). Keep in mind that you are not alone; parents all over the world are dealing with this difficult but normal stage. At this stage toddlers can understand right and wrong, so natural consequences (the automatic result of their behavior) tend to work well. Let’s say your toddler deliberately drops a toy behind the couch. You retrieve it and explain that you’ll get it this time, but you don’t want her to do it again. You guessed it, she does it again! The natural consequence is that she loses the toy, at least until the next time you clean under the couch. Like natural consequences, logical ones are connected to her behavior. Unlike natural consequences, they’re imposed by you. For example, your child throws her cup on the floor during dinner. You pick it up, put it back on her tray and say: “Cups stay here. We do not throw cups.” When she throws it again, the logical consequence is to say: “No more cup,” and put it in the sink. You can offer her water after the meal if she’s thirsty. Natural and logical consequences tend to be effective, but when they’re not (or if your child exhibits “red-light” behaviors like hitting, biting or running away from you in a parking lot) you may consider time-outs or time-ins. Time-Out —Little ones do not like to have to stop what they’re doing, sit still by themselves, and be ignored for a designated period of time. The idea is that time-outs are so unpleasant for them that they learn not to repeat the behavior that sent them there in the first place. Hold your child on your lap, facing away from you. Guide her to sit in a chair and hold your hand on her lap or shoulder. Instruct her to sit in a chair (or other location) until the time-out is over. After the time-out is over, allow your child to resume what she was doing without further discussion or lecturing. Time-In — There’s lots of debate in parenting circles about time-outs. Some say it doesn’t actually teach the child anything, and suggest “time-ins” instead. Various versions of time-in exist. A common one is to remove your child from the situation in which she’s misbehaving and sit with her. Help her calm down, and talk about what she did wrong and what is expected. Another version is to set up an area in your home with books, stuffed animals, or other quiet activities. When your child misbehaves, send her to this time-in area, where she can learn to calm herself down and think about her behavior. Try weaving humor into your discipline, which can be surprisingly powerful! You can find examples of how to do this here. Above all, be consistent, which is key for effective discipline. Try to match specific behaviors with specific consequences, and implement them every time.